We’re sticking it to plain and boring recipes, literally: these skewers pointedly make the case for trying something new, fresh, and exciting. The chunks of zucchini, mushroom, and bell pepper lined up on them are brushed in a tangy mustard marinade with multidimensional flavor. For extra action, there’s also an herb couscous and corn tomato relish. Oh, and we should mention that these are just as sensational cooked on the grill as they are in an indoor kitchen. 1-Wash and dry all produce. Preheat broiler to high. Place skewers in a dish or wide bowl; cover with water and soak. Core and finely dice tomato. Drain and rinse corn. Core and seed bell pepper, then cut into 1-inch squares. Slice zucchini into ¼-inch-thick rounds. Trim, then halve mushrooms. Chop parsley. 2-Bring 1 cup water, stock concentrate, and a pinch of salt to a boil in a small pot. 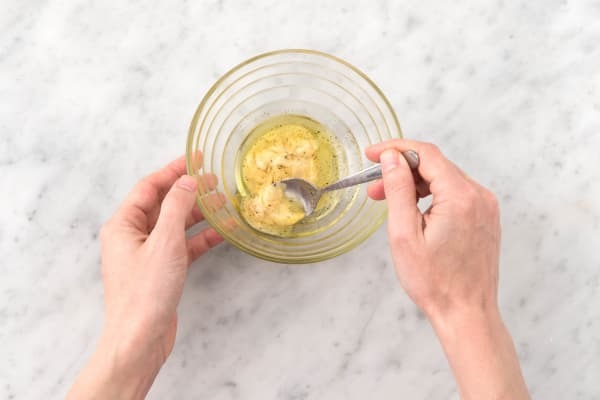 Meanwhile, combine garlic powder, 1½ tsp vinegar, 1 tsp mustard, and 1 TBSP olive oil in a small bowl (we sent more vinegar and mustard—save the rest for step 5). Season with salt and pepper. 3-Once stock is boiling, add couscous to pot. Cover and remove from heat. Let stand until rest of meal is ready. 4-Remove skewers from water. 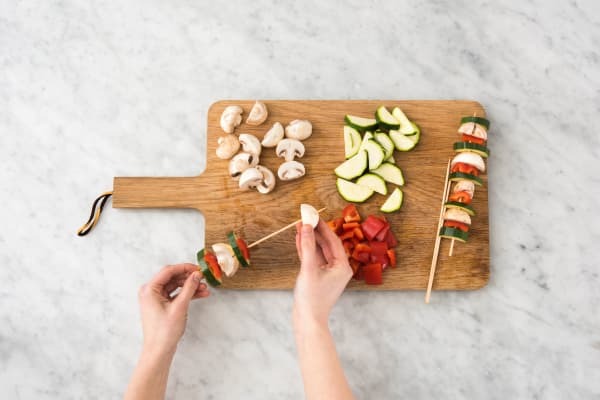 Thread mushrooms, zucchini, and bell pepper onto skewers, alternating between each. Brush with mustard marinade. Season with salt, pepper, and 1½ tsp Mediterranean spice (save the rest for the next step). Place on a baking sheet. Broil until lightly charred and tender, 6-8 minutes per side. TIP: Short on time? 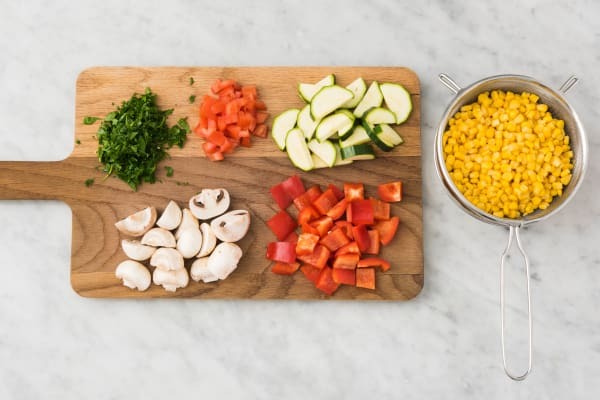 Skip the skewers and place veggies directly on baking sheet. 5-Heat 1 TBSP olive oil and 1 TBSP butter in a large pan over medium heat. 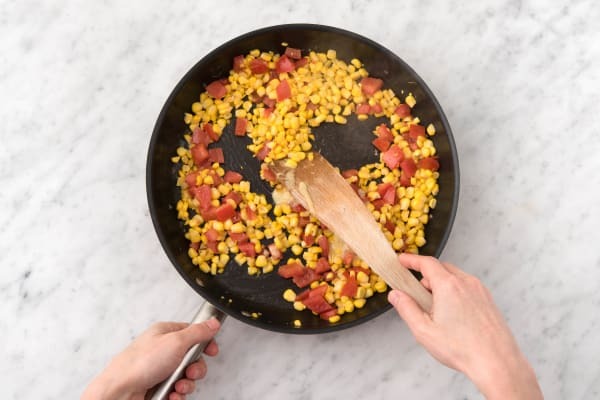 Add tomato and corn. Cook, tossing, until tomato softens, 4-5 minutes. Stir in 1 TBSP white wine vinegar and 1 tsp mustard (you will have some vinegar left over). Remove pan from heat and let stand a few minutes to cool, then stir in feta cheese. Season with salt, pepper, and remaining Mediterranean spice. 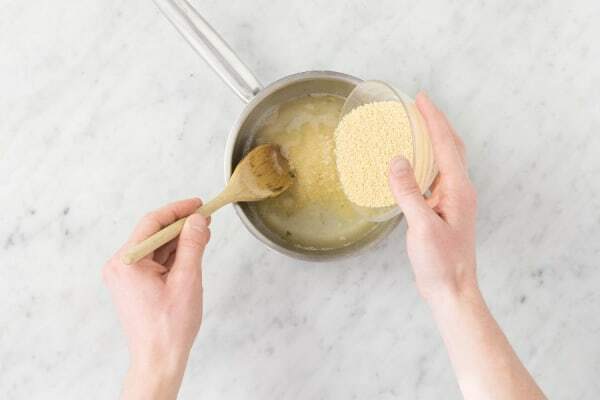 6-Fluff couscous with a fork, then stir in parsley, 1 TBSP butter, and a drizzle of olive oil. Season with salt and pepper. 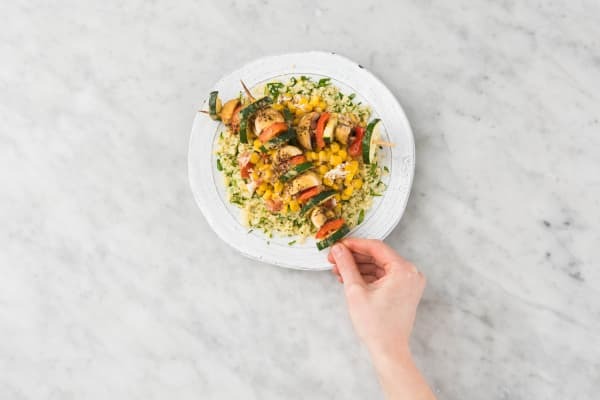 Divide couscous between plates, then top with corn relish and veggie skewers.